This is the x86 verson and it will not run in x64 Windows 7. Also, my scan ran for just 2 seconds and indicated that my system is not infected. Unsure of the speed and scan quality, therefore I just gave it 3 stars. To be fair, this software may deserve 5 stars if it truly scans a system in lightning speed AND thoroughly. On my WinXP.sp3 i have started it, it has installed a driver and asked me for a reboot. I rebooted, and.... bang... BSoD on 'tm.sys'. I had to remove this driver into safe mode from my "\system32\drivers" folder. I score any bas**** company that is pre-installed on systems a big fat ZERO. People should NOT pay an extra price for crap software, they should be able to have a choice ! And then we didn't even talk about how ustable your system gets after """uninstalling""" this bunch of big-corp crapware. I'm on Win xp this scans and picks up 31 items requiring a restart to complete deletion but doesnt delete anything , so whats it supposed to do ? It does not do a very in-depth scan but thats what it is designed for. Runs fast, no install though have not looked through registry yet for a hook. I would say this is another program to have on your portable USB tool kit drive for those ooh, ooh moments! Nothing beats a back-up program a virtual disk or a sand box program so you never need to run this program. A 4 rating as it does not do a in-depth scan as per Mcafee Stinger but it does do what it is supposed to do. It's improved, very fast scanning it removes MBR rookit too. 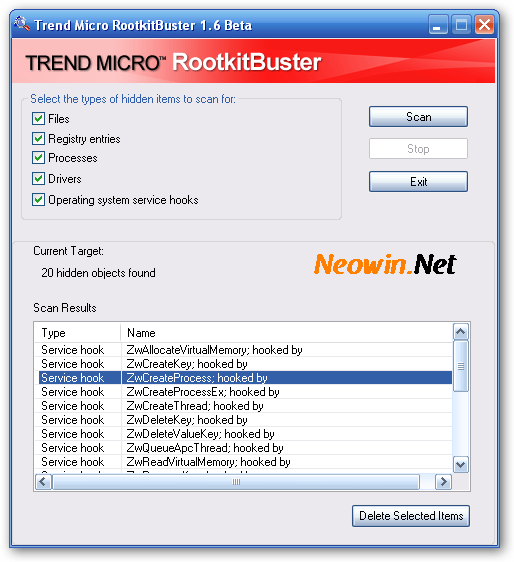 Excellent and easy to use Rootkit Scanner. They removed the OS Service Hook option to prevent false positive detections. The scan with standard settings didn't finf anything. But when I selected to scan OS system service hooks it wanted do delete vsdatant.sys in the system32 folder. I looked it up and it's a component from ZA, so I don't think I can safely remove those items. This, as many other, rootkitbusters, doesn't work on a 64-bit Windows. Useless ! I ran it, with systemhooks enabled and it detected that my kaspersky antivirus had hooked into some system things, didn't find anything else. Hard to rate when the system appears to be clean. I guess it does what it proclaims to do and it does it fast, didn't take more than a minute to run on my Atlon XP machine.